Wes Hoolahan and Glenn Whelan look likely to be ruled out of the Republic of Ireland's Euro 2016 qualifier against Scotland on 14 November. 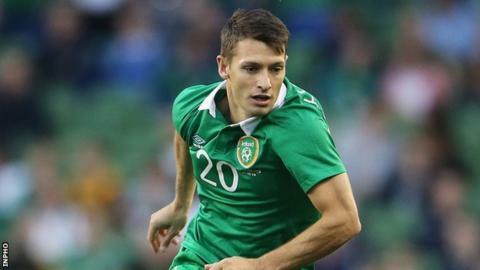 Norwich manager Neil Adams said on Thursday that Hoolahan would be out for a number of weeks because of ankle ligament damage. Stoke midfielder Whelan is expected to be missing for around six weeks because of a leg fracture. Whelan sustained the injury in the Republic's 1-1 draw in Germany. The 30-year-old subsequently missed Stoke's 2-1 victory over Swansea on Saturday, and is now unlikely to return until early December. "He got a kick on the outside of his leg, and there is a slight fracture there," said Stoke manager Mark Hughes. "The likelihood is he's going to be out for four to six weeks I'd imagine, which is a blow for Glenn obviously because he is a big part of what we're doing, and we'll miss him. "As for Ireland, knowing Glenn he'll try and make himself available, but my feeling is the game will be too soon for him." Norwich boss Adams revealed that Hoolahan had seen a specialist on Wednesday to ascertain the extent of his injury he sustained in Saturday's 1-0 defeat by Fulham. "It's ankle ligament damage, as we first feared," Adams told Norwich's website. "It's a shame, obviously you keep your fingers crossed but it's going to be number of weeks before he's back with us unfortunately." Hoolahan started and scored in the 7-0 thumping of Gibraltar and then came on as a substitute against Germany, providing the cross that led to John O'Shea's late equaliser. Martin O'Neill's side lie second in their group after three rounds of fixtures, level on points with leaders Poland, and three points ahead of world champions Germany and Scotland.